Jason Dymock picked up his baby-poo, beige 1985 75 Series, leaf sprung farm hack as a total stocker. It had served its time well; carting hay and slipping through nothing more than cow dung and gravel tracks for just shy of the half million kilometre mark – all under the gentle guidance of its hard working farmer owner. This was exactly the type of truck Jason was after – straight body, no rust, dual factory fuel tanks and he knew he’d recoup most of his money in selling off all the unused and unwanted parts, to make way for his intended changes. So who in their right mind would purchase a 4WD, only to sell most of it in parts? Someone who was intent on competing, touring, commuting and wanting to play hardball in the low range world of 4WDing! Someone who was capable of building their very own, very unique, Total Toyota! Although Jason is the proprietor of Total Care 4WD, in Sydney’s west, much of the finished product you see here was the result of many hours of research and hard work…oh and not to mention rebuilds after one belly-up experience on the rocks. Jason’s first priority for his Cruiser was to take on as many 4WD competitions as possible. Leaf springs wouldn’t offer the suspension flex he was after, so all original mounting points for the one tonne rated leaves were ground off the chassis. In their place, Jason welded in a complete 80 Series front and rear, coil spring suspension, using a combination of standard 75 and 80 Series steering components. This enables replacement parts to be easily sourced if needed. The ARB Old Man Emu shocks and coils are three inches taller than standard and all locate as per standard 80 Series. Jason modified the front (reputedly weaker) housing to accept a rear 80 Series diff centre, resulting in a larger and stronger front end. Both diffs now run ARB Air Lockers, which are controlled by a dash mounted button via the under bonnet air compressor. With no interior cabin room, save for driver and passenger, Jason figured on lopping the rear wall off, extending the side panels, adding small side windows and reattaching said rear wall to provide an extra cab that looks as factory as any we’ve seen. A Troop Carrier turret (roof) was shortened and use in place of the ute roof. 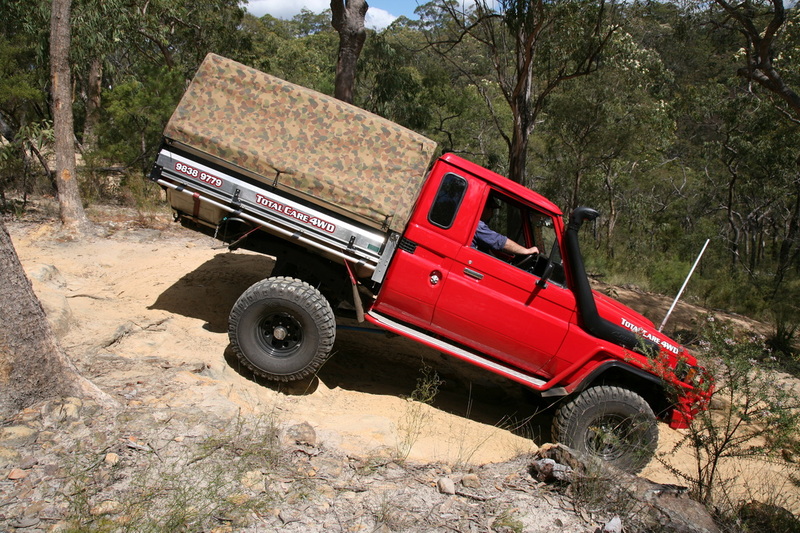 This provided extra strength as a Troopy turret has extra ridges over a ute roof to help reduce drumming and twisting. The whole job was crafted in steel and followed all the standard lines and creases, making any aftermarket joinery hard, if not impossible, to pick. The standard huge-hay-hauler tray was sold off and replaced with a neat, smaller, Jason-built number, which offered much-improved departure angles as it was positioned higher and shorter than the original. 20L water jerry cans are hung under the rear corners for quick access to the H2O. While the original 4.0L diesel engine was still going strong, even with huge kilometres clocked up, Jason wanted just a bit more punch than the old oiler could provide, so converted the ute to run a V8 350 Chev on LPG, backed with a T400 auto gearbox. Now there were smiles all round for our comp-ready lead foot, as he had the flex, the height, the angles and the economical noise to make a big impression on the comp scene – and so he did until a big roll over that saw the project shelved for almost three years…a sad period for sure! With age, generally there comes maturity with a gentler approach to most things. Not so with Jason, he was still keen to be seen steering a unique, incredibly capable 4WD, but now needed a touring vehicle that could also double as weekday tourer. The three year old dust and spider webs were blown off and the whole extra cab conversion redone to rid old memories of that rock-rash inducing day that saw his project shelved. Out came the Chev V8 and T400 and in its place a Toyota 1HD-FTE six cylinder factory turbo diesel engine with Toyota transfer case and 5-speed auto gearbox was fitted – all courtesy of a 100 Series LandCruiser wagon. Remember the maturity-with-age thing we mentioned above – well this is where Jason just couldn’t help himself…enough power is just never enough! He’s included a top mount water-to-water intercooler and three inch mandrel bent exhaust to bump the already impressive power figures even higher to the point that this engine now offers superior outputs than the old Chev petrol V8. The same coil suspension, diffs and ARB AirLockers complete the drive line, with the inclusion of a Safari Snorkel, steel Pro Comp rims with 35 x 12.5R15 inch Pro Comp directional tyres and a 120 litre rear stainless steel tank to compliment the standard 90 litre front number helps with the intended touring. A steel ARB winch bar with Warn Hi Mount winch running synthetic rope and Hawse fair lead take care of protection and recovery. HID head light inserts and bar mounted spotties help forward vision, while underbody and rear facing lights help for rock crawling and setting up camp after dark. Inside the extra cab, Jason has fitted electronic adjustable Recaro seats with lumbar adjustment and arm rests – may as well be comfortable on those long runs as well as to and from the local shops! A GME TX3400 UHF radio has been fitted to the centre dash, while a quartet of gauges (turbo boost, exhaust temperature, oil pressure and engine temperature) have been squeezed into the standard top-dash pod, even though it was only meant for three gauges. Three batteries (two under bonnet and one under the tray), controlled by a simple solenoid system, allow plenty of carefree days camping without the need for repowering. These days Jason and his good wife sleep in the tray with camo canvas canopy, which was custom made by All Terrain Camper Trailers. It’s a simple camping setup, which Jason tells us makes for easy, nothin’-to-go-wrong travelling. They simply lift either left or right canopy side, wedge it open with an adjustable tent pole, extend the rolled up side canopy to provide a large covered area for cooking or shade from sun n’ rain. Inside the canopy is a trusty old original (green and white) Engel fridge, double swag, a couple of storage boxes and a few odds n’ sods hanging from the canopy rack. Depending on the weather, the couple will either sleep up in the canopy or on the ground under the awning. Jason’s engine conversion has utilised all Toyota parts, albeit from a few different models, that can easily be repaired or worked on with standard parts. If by chance something does go wrong, Jason’s pretty sure he could pick up parts or have his truck worked on anywhere in our great country – outback or in the cities. The 1HD-FTE factory turbo diesel is one of the finest 4WD engines Toyota has ever offered. It outputs plenty of low down power and torque – just perfect for steep hill climbs, low range work, towing, cruising and of course trundling along in peak hour traffic. At this stage Jason has opted not to fit an aftermarket engine management module – what’s the bet that’ll be changed sooner rather than later for even more off-the-shelf power? Don’t let that old-age sensibility thing get to you mate! The use of a complete 100 Series LandCruiser driveline - engine, transfer case and 5-speed auto is, in Jason’s mind, the best option as it’s strong, offers excellent low range gearing, ‘talks’ perfectly (electronically) to the engine and allows Jason’s lazy left foot to take it easy on the foot rest…and perhaps indulge in a little left foot braking when the need arises. Front and rear tail shafts have been lengthened and shortened respectively to mate into the 80 Series diffs, which have 4.1 ratios installed to help re-gear for the larger 35 inch rubber. Remember we mentioned Jason had fitted a rear 80 Series diff centre into the front modified diff pumpkin – that has proved itself numerous times to offer plenty of increased strength with no breakages on any gears or CV’s. With the myriad of changes and modifications to this Cruiser, some may think it could ‘drive-like-a-dog’. Nothing could be further than the truth; the well-executed changes have been done with all minor details taken into consideration. The on-road suspension and steering dynamics are superior to standard, power outputs are a huge step up over standard, off road ability simply blows standard credentials out of the park and automatic gear change commuting in frustrating city traffic is oh so easy. The extra cab conversion plays a huge role in making life comfortable in the cabin with improved seating room as well as plenty of space to store all those little bits n’ pieces behind the seats. Full marks to Jason for the build up of his Total Toyota – why settle for less when you can modify one to make it better?